Des Moines is blessed with a whole bunch of summer camps! Even overnight camps that are all about good old-fashioned swing-on-a-rope, splash-in-a-pool type of fun. Sometimes what our kids really need is to spend a couple of weeks in the fresh air doing things that won’t necessarily fill a college application, but sure will fill a memory book. For those types of summers, we offer 9+ great summer overnight camps. Note: This is a working list, so check back often for new listings. 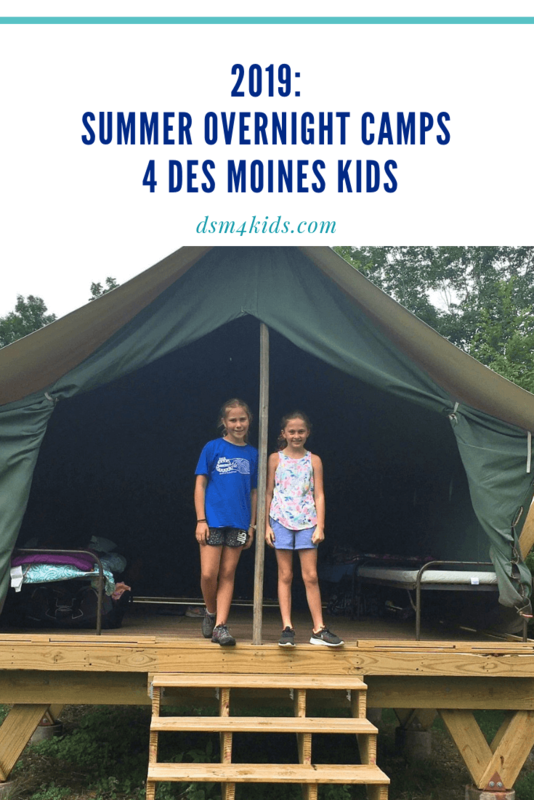 If you know of a day camp or overnight summer camp that you would like to have included to this guide, please email the listing information to nicole@dsm4kids.com or leave a comment below. Camp Fire Heart of Iowa offers a wide variety of programs throughout central Iowa fitting the needs of overnight campers. Whether you like creek stomping, bugs, or sports, they’ve got a summer of fun waiting for you! Programs are offered for kids in 1st – 12th grades. At CYC, campers leave behind the distractions of daily life and trade technology for a week on Lake Panorama. Catholic Youth Camp is a traditional sleep away summer camp and that means tons of fun activities. Campers will also be immersed in sacraments, scripture, prayer and enjoy daily mass. Three to five-day camps are offered to kids entering 3rd-12th grades. Children and adults with and without disabilities enjoy all Easter Seals Iowa Camp Sunnyside has to offer including canoeing, an animal farm, horseback riding, archery, nature trails, the Variety Club Rec Center, an accessible indoor pool and the Meredith Tree House. At night campers sleep in new, air-conditioned lodges. Sessions are held at Camp Sunnyside for campers age four and older. Week-long and day camps are offered during the summer. Iowa United Methodist Camps offer many different activities at each of their sites at Lake Okoboji, Pictured Rocks, and Wesley Woods Camp and Retreat Centers. You’ll have the best week ever with their caring staff to guide you. Every camper can find something that they’ll enjoy, including adults who wish they could come to camp, too! Lakeview is a Christian camp located in Pella. They offer summer camps for all ages including day camps, overnight camps and grandparent/grandchild camps. Campers are divided by the grade they will be entering into the following fall. Elementary Camps, Middle School Camps and High School camps all enjoy appropriate activities for each group. Located in Story City, Riverside offers a wide range of summer programs from half week sessions for their youngest campers, to full week programs for campers entering 3rd grade all the way through high school. Riverside also has a beginner and intermediate ranch camp program as well as an adventure camp focused on growing in faith. Wesley Woods is a United Methodist Church camp and retreat center located just outside of Indianola. They offer both summer day camps and overnight summer camp opportunities for kids of all abilities. Overnight stays can be as short as one night, half-week and a full week for kids ages 5 to 18. Willowbrook Bible Camp offers three sessions of summer camp for kids ages 8 to 18. Your child’s week at Willowbrook will be filled with various sports activities, lots of great singing, lazy afternoons, and cozy campfires. Willowbrook is a Bible camp, so they make the study of the Bible a major emphasis during camp. Traditional overnight camp is the mainstay of Y Camp’s summer camp program. It is a great opportunity for kids to experience the many programs and activities that Y Camp offers. Campers are part of a cabin of similarly aged peers, with whom they deliberate and decide on what their week will entail. The Y offers a wide variety of overnight camps and activities for kids ages 7 to 16. Many youth organizations such as 4-H, Boys Scouts, Girl Scouts and Boys & Girls Club offer summer overnight camp opportunities. If your children already participate in one of these programs, be sure to check out what summer camps and classes that they offer. Plus, if you’re looking for even more summer camps and classes options, we will be updating our Summer Camp Guide over the next few weeks to keep you up-to-date on the latest camp offerings. What’s your favorite summer overnight camp for kids in Des Moines? Help everybody out and give it a shout out!